Of all the cities I have visited so far in Bolivia, Sucre has by far been my favorite. The “white city” is a treasure trove of history, architecture, and culture. There are plenty of museums in Bolivia’s capital (if you’re a museum lover, I recommend the Casa de la Libertad or the San Francisco Basilica and its catacombs), but there are also lots of other things to experience. A trip to Bolivia is incomplete without a visit to Sucre, and even though we were only able to visit for a few short days, I could have wandered the clean, bright streets there for weeks! 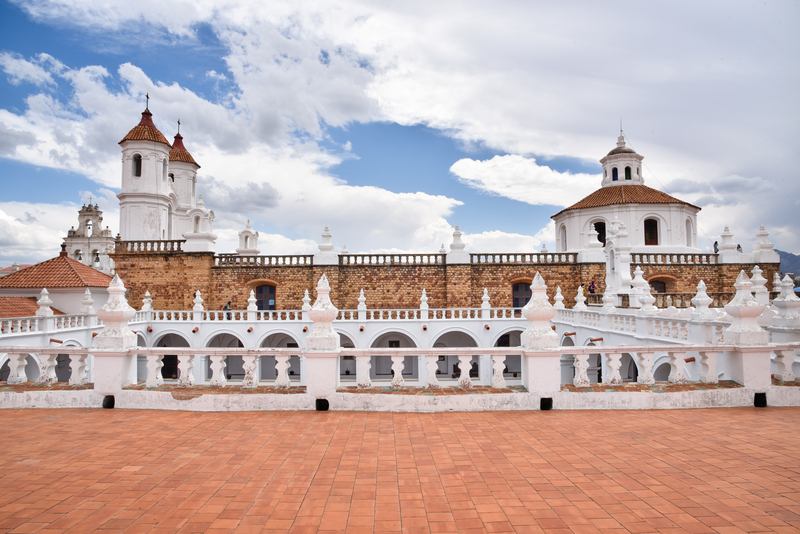 Something unique about Sucre is that it is home to the largest site of dinosaur footprints in the world! About 5 km outside of the city center is the Cal Orck’o site and museum, where a cement company uncovered a giant wall holding over 5,000 dinosaur tracks! To get to the site, take the “Dino Bus,” a red double-decker that runs hourly, from Plaza 25 de Mayo. (You can also take this bus back to the main plaza after your tour.) When you get to Parque Cretácico, you will be paired with a tour guide who will give you a brief overview of the site and take you out the giant wall to see the prints for yourself. (Heads up: You will need closed toed shoes to participate in the full tour!) For the best views of the footprints in the sun, it is recommended to visit between 11am and 1pm. This is a must see on your trip to Sucre! This convent, built in the late 1700s, is a school today, but for those will to pay a few Bs it offers excellent views of Sucre and some stellar photo ops. It is open after 2pm on most days, and, to get in, walk down Nicolas Ortiz street a little ways from the main church doors until you get to a doorway with a small plaque reading “Museo San Felipe.” You may have to ring the doorbell! Once inside you’ll have free reign of the place to explore the courtyard, chapel, and, most importantly, the roof! The views are phenomenal! This pink castle on the outskirts of Sucre is one of the strangest things I have seen in Bolivia. It is a mismatched jumble of different architectural types, and it used to be the home of the only prince and princess in Bolivia’s history – declared royalty by a papal bull in the late 1800s. It was fun to wander around and explore the many rooms of the empty castle. Don’t miss the spiral staircase climb up into the tower! To get there and back, take city bus #4. It might sounds strange to recommend visiting a cemetery as a tourist, but the Sucre General Cemetery is more like a park. Well kept green spaces and immaculate mausoleums make the cemetery truly beautiful. Even the somewhat sinister gate inscription: Hodie Mihi Cras Tibi (which means “Today me, tomorrow you”) actually seems to have more of a peaceful, matter-of-factness about it than a threatening nature. A classic Bolivia brunch food is the salteña, a delicious, juicy, stuffed pastry. El Patio is the best place to start your day in Sucre with a salteña! To order, stop at the cashier on your way in and order a “pollo” or “carne” (chicken or beef). Pair it with a fresh juice and enjoy in the bright, clean, outdoor seating area. Enjoying a delicious pollo salteña and jugo de frutilla con leche (strawberry juice). One thing you have to try while in Sucre is the chorizo chuquisaqueño, a delicious sausage from the region. El Huerto is the place to go! Located a bit out of the way, but a short walk from Parque Simon Bolivar, this place has lots of traditional dishes from Chuquisaca and a large outdoor seating area. I highly recommend the chorizo appetizer! La Recoleta is a picturesque area that offers a great view overlooking the city. Beneath the plaza’s white arches is a cute little café that is a perfect place to enjoy some Italian food and watch the sun set over “la ciudad blanca.” If you fancy an uphill walk, La Recoleta can be reached from the main plaza in about 20 minutes, but you can also easily take a cab to the Mirador. For a fancier dinner option, La Taverne cannot be missed. Located a block away from the main plaza, this French restaurant has an incredible menu, and it was by far our favorite meal in Sucre. I hope you get to Sucre and enjoy your time there as much as we did! If you’ve been to Sucre and have more suggestions for visitors, comment below! I would love to visit there. Infact I would LOVE to visit YOU. Your report was great. Such detail. I must be very lovely. Thanks for sharing. Really enjoyed this Sarah. My bags are packed!! Hope you and Andrew will have a wonderful Christmas. Love you! Really good informative blog. Sucre looks like a lovely place! Thank you! I hope you get a chance to visit! Happy birthday to this little nugget ❤️😄 25 years ago you changed my life and I couldn’t be happier to be your sister. I love you!